Dezeen has teamed up with Blue Crow Media to give away five copies of a map detailing 40 examples of brutalist architecture in Washington DC. This competition is now closed. Congratulations to the winners, which are Champaklal Lad from Lancashire, UK; Nicholas Eccles from Kingston, Australia; Allan Wilson from Larriston, Scotland; Linda Lockwood from Hampshire, UK and Bart Kusters from Best, Netherlands. The double-side foldout guide pinpoints the locations of buildings across the US capital, including the J Edgar Hoover building, Georgetown's Lauinger Library and Dulles Airport. Each building is accompanied by photographs and information, including date of completion and the architect responsible. Lesser-known buildings like the the Woman's National Democratic Club Annex, National Presbyterian Church and Reston's Lake Anne Plaza also feature. Independent map publisher Blue Crow Media collaborated with Deane Madsen of Architect Magazine to create the Brutalist Washington Map, aiming to bring attention to the city's brutalist architecture at risk of neglect and, in some cases, demolition. "We hope that putting these examples of DC's Brutalist architecture on the map will foster public appreciation that ensures their longevity," said Deane Madsen, who is associate editor of design at Architect Magazine. "The Brutalist Washington Map is designed to affirm the value of these buildings and to inspire further consideration of Brutalist architecture today." Over the years, the movement has proved controversial – meaning many examples have faced demolition. For example, a campaign to save the Smithsons-designed Robin Hood Gardens estate in London failed and the building is due to be pulled down. Similarly, the Sirius apartment building in Sydney has also seen protests against its demolition, after being denied a heritage listing. 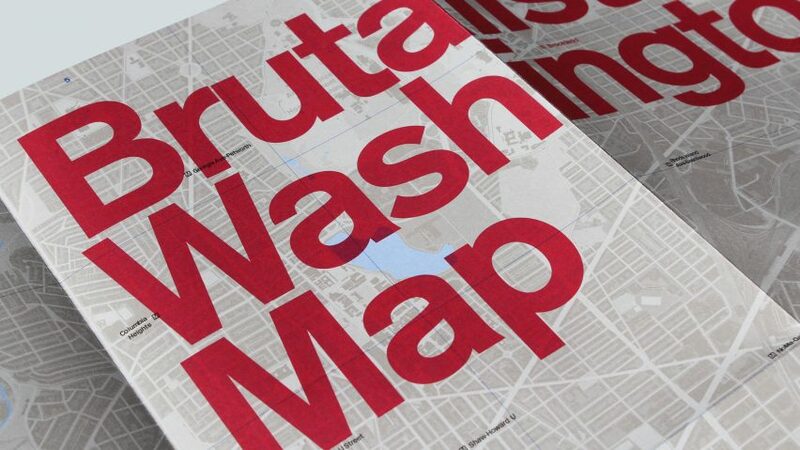 Five readers will each win a copy of the Brutalist Washington map, but it can also be also purchased online for £8, which equates to just under $10. The Brutalist Washington Map is the latest in a series of architecture maps produced by Blue Crow Media. Previous editions include a map of London's brutalist architecture and another focused on constructivist architecture in Moscow. Photography is by Deane Madsen.